There is a tendency today to decorate bathrooms with neutral colours and light tones, probably to make it seem that much bigger or more spacious. However, the use of colour in bathrooms can make a huge difference and inject the space with personality and charm. 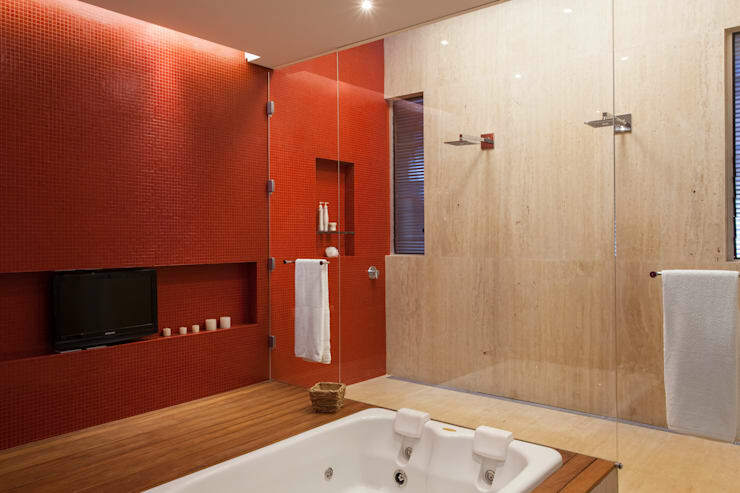 You can use warm colours or cold colours in the bathroom. Cold colours can create a sense of cleanliness, lightness and tranquility, while warm colours can evoke a sense of homeliness and comfort. People often use warm colours for children's bathrooms. If you prefer warm colours, yellow can be a great option. 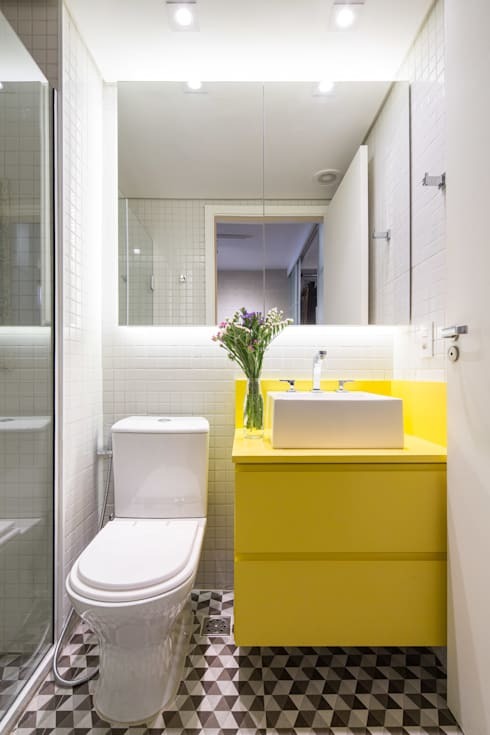 Yellow also illuminates a small space, especially if there are no windows. Blue can also be a great option, creating a very restful and peaceful bathroom space. Another option is to go for purple or ocher. If you want to be a little bit more creative, you can opt for prints and designs, which are excellent ways to introduce colour into a bathroom. So today, we are going to take you on a tour of some fabulous bathroom spaces and show you how gorgeous colours can really be! This bathroom, designed by architect professionals MOB Architects, shows how neutral tones can be a great base to start from. The floor features neutral tones while the walls feature a white base. This creates a very serene environment. The designers have then used the space behind the mirror to introduce colourful veneer to the space. This adds a daring touch to the room, without overwhelming it. As we've mentioned before, bathrooms often feature neutral tones and light colours to create a sense of spaciousness. However, sometimes we need something a little bit more vibrant and enchanting, especially for a child's bathroom. In this design, by Aclaene de Mello, we come across a bathroom that belongs to a family that features a six-year-old girl. 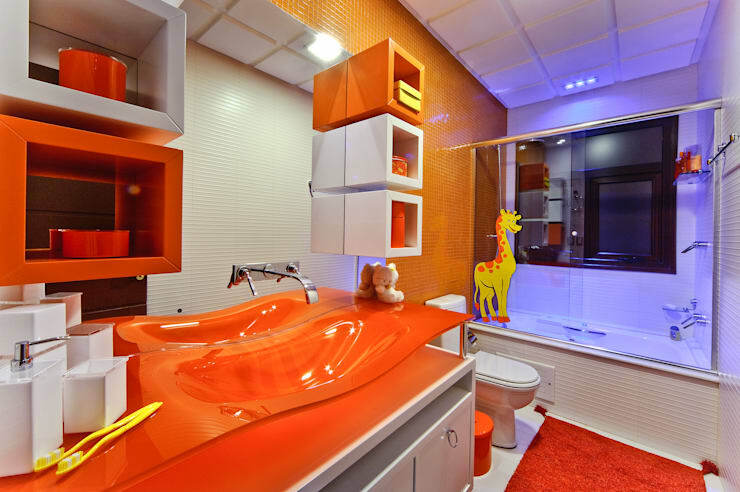 The orange bathroom is cheerful and inspiring and packs quite a visual punch! Orange has been used on the walls, for the sink counter, in the niches that line the mirror, for the rug and for the waste basket. You'll notice that white features break up the orange tones. Finished in a very modern style, the bathroom also features such unique shapes and accessories, creating a welcoming environment that will be appealing to the little girl throughout her childhood! 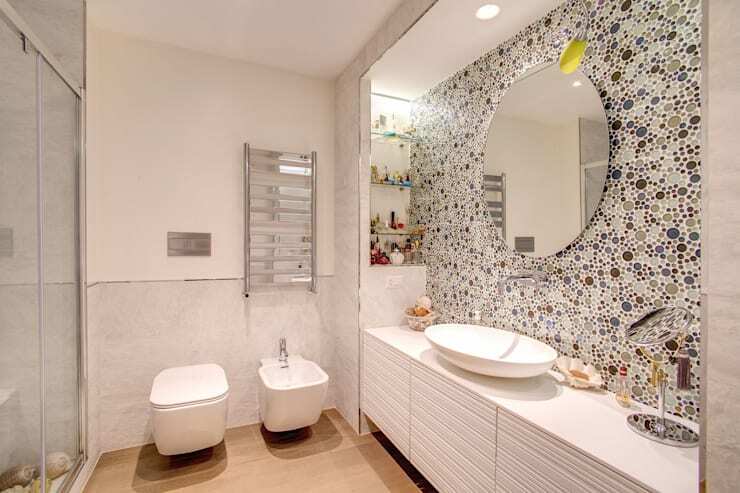 This small toilet bathroom dares, dazzles and delights with its combination of colours! The side walls feature a rose-coloured tone, creating a very elegant environment, while the far wall features tiles with different sized, colourful circles. The white walls neutralize the colours, while making this little room seem more spacious. Country-style homes or rustic bathrooms usually feature warm and earthy colours that remind us of natural elements such as fire or clay. This is the case with this elegant and almost minimalist bathroom, that contrasts the ocher colour of the wall with the wooden deck that surrounds the tub. The effect is a very warm and welcome space that isn't too overwhelming. The large glass mirror and light granite floor balance the environment delicately. Very small bathrooms don't often have windows, which makes it necessary to invest heavily in artificial lighting throughout, which will compensate for the lack of natural light. In these spaces, colour can really be an ally, helping to illuminate or enhance the environment. In this picture, we come across a modern bathroom and toilet space, with predominantly white colours. However the designers have also added a bright yellow cabinet to the space, under the sink. This gives life and luminosity to the bathroom. The furniture also works flawlessly with the geometric patterned floor. An old trick is to use a large mirror, like these designers have done, in a small space, to create the feeling of depth. Have a look at these other 11 clever ways to use mirrors in your home. The result is a very appealing bathroom despite the size. There are those who prefer to use colder colours in the bathroom, but that doesn't mean you can't opt for softer and prettier tones. Quite the contrary in fact! You can dare – with elegance – with cooler colours! 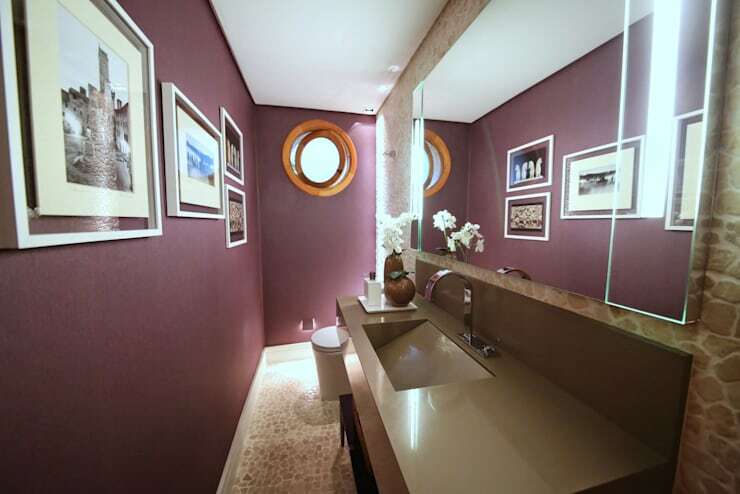 This is the case in this bathroom, where the walls are painted a very sophisticated shade of purple. The colours harmonize perfectly with the neutral coloured sink and the clear stones on the floor, while the large mirror finishes off the look and feel perfectly. Lastly, the white picture frames on the wall contrast beautifully with the purple tones, while refining the environment. Don't you love the small wooden window? This is a simple feature that adds personality to the space! Blue is a colour that always works well in the bathroom, evoking a sense of cleanliness and tranquility. You can opt for a variety of shades of blue, however, depending on if you prefer lighter tones or darker tones. 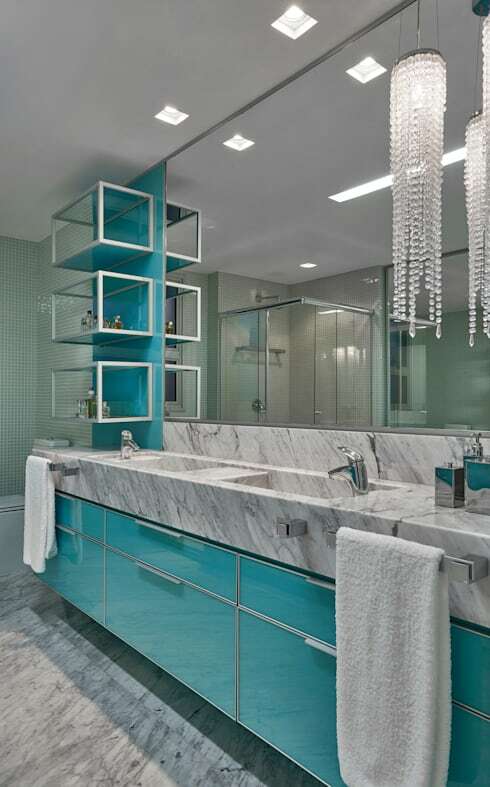 Turquoise has been chosen for this bathroom, creating a very lively bathroom space. The wall and cabinet are finished in the blue tones, contrasting with the grey marble counter tops and the large mirror. This is a truly beautiful space! You can feel the serenity and tranquility just by looking at this picture! Less stimulating than red, pink is a wonderful colour, usually associated with the feminine. You can use softer, pastel shades of this colour or you can use more vibrant shades of this colour, as we see in this image. Whatever shade you go for, you can create a gorgeous ambiance! 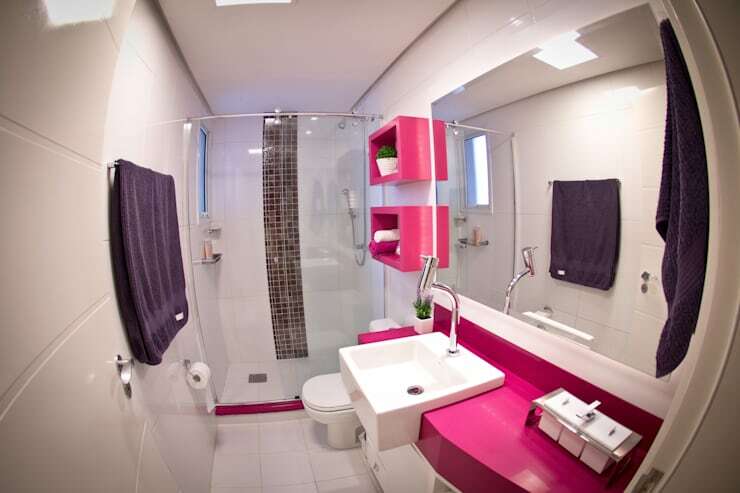 This bathroom features a bright pink counter below the sink as well as bright pink niches on the walls. This adds life to the predominantly white bathroom, while giving the space a sense of freshness and lightness. This bathroom is perfect for young and creative people who like a touch of the eclectic. 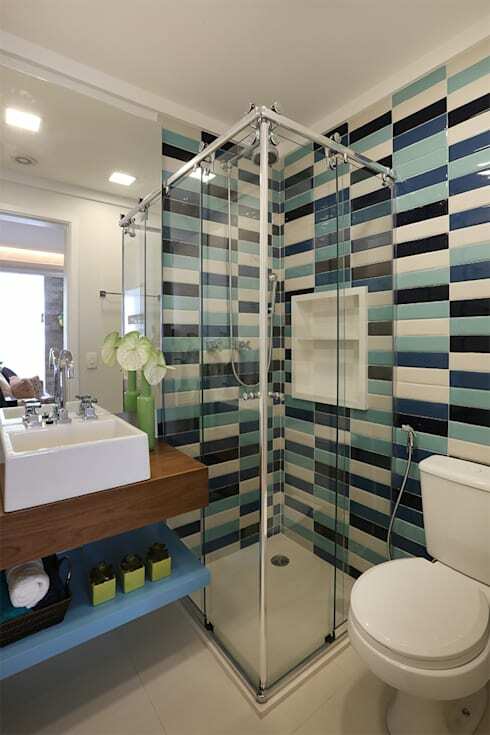 This bathroom uses colour to create geometric patterns from floor to ceiling. The designers have used tiles to introduce these colours, creating a very dynamic bathroom space. Light blue, white, grey and black all alternate for a stunning visual impact. The result is a bathroom full of style, while remaining soft and inviting. This same striped effect can be achieved with warmer colours, with a more vibrant result. If you've enjoyed this article, you'll love these 14 super wall design ideas. Which colour would you choose for your bathroom?